This page may require cleanup to meet basic quality standards. The specific problem is: Overly detailed, awkward non-standard layout.. You can help by modifying the article. The discussion page may contain useful suggestions. 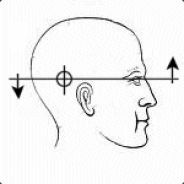 Invert y-axis is also known as y-axis inversion, reversed mouse or inverted camera controls. Y-axis inversion is an alternate to whatever are generally defined as the standard camera controls for a game. Standard camera controls normally have the 'looking up' control mapped to a mouse or controller being pushed forward. Y-axis inversion has the opposite action, where mouse or controller being pushed forward results in the camera being pointed down. This is also the standard control scheme for most flight simulators with joystick controls, and many PC gamers transferred this control scheme over to other games which involve any type of camera control (including first and third person three dimensional games). Therefore, the vast majority of games have an option to toggle from standard to inverted camera control. Generally speaking, the PC gaming community will modify popular games if they lack a y-axis inversion option. However, some games are not mod-able in this fashion, and requires more brute force methods of enabling y-axis inversion on a system-wide level. 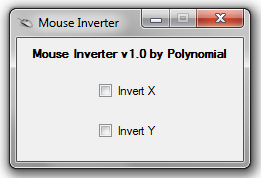 Polynomial's Mouse Inverter is currently the best option for forcing inverted mouse controls on PC. Polynomial's Mouse Inverter was created as a solution for a StackExchange user who needed inverted mouse drivers for a dyslexic user. It was created and posted on 30 March 2012, and it is compatible with Windows x64. Requires the Microsoft .NET Framework 4.0 to run. It is the most recently developed y-axis inversion hack, and is currently the best and most user-friendly way of inverting the y-axis. Alt+⊞ Win+Y - toggles Y-axis inversion. Minimises to the system tray. Right-click options allow toggling the y-axis inversion without opening the program again. Does not load the inversion by default when you run for the first time (unlike SakasaMouse). Not designed to work with multi-monitor setups. It will not allow you to move the mouse outside of the current primary screen. Due to technical limitations, you will also be unable to move your mouse within 2px of any screen edge whilst inversion is enabled. SakasaMouse is a freeware program was developed as a 'joke' program to install on the victim's computer, which would invert all mouse movement on y-axis as well as x-axis. However it is one of the few freely available programs which can invert the y-axis globally on modern versions of Windows. Version 1.03 was last updated on 29 October 2006, and has been tested to work on Windows XP, Vista and 7 and also in its x64 variant. It is available to download on ARA's website (a Japanese website). The program runs as a utility in the system tray. Configuration options allow toggling y-axis and x-axis inversion independently. Reportedly that it may occasionally crash. The program loads inversion as soon as it is opened, so be prepared! A display of the mouse drivers in the .zip. This driver is a utility developed by MAF-Soft, which works by installing a driver over a specific mouse. Its x64 variant is in beta, and does not support USB mice, and the x86 version will not work on x64 Windows. The personal license costs €12. Open the Properties of the mouse you want to install the driver for. Click the Driver tab, and then click Update Driver (from here, it can also be rolled back later). Follow the wizard's prompts, and when prompted, select the "Display a list of known drivers" option. Then click Next. Click Have Disk and then point to the location of the .inf files. Press and hold the middle mouse button (or mousewheel). Release the middle mouse button. Release the right mouse button. A version without the use of a middle mouse button is available by contacting the author of the driver. It is possible to install a specific driver to different mice, so one mouse is always y-axis inverted, the other is not. Relatively difficult to use compared to SakasaMouse, as it requires installing custom drivers. Personal license cost is €12, and persons with disabilities may receive it for free. Trial version is 32bit (x86) only, and deactivates after an unknown amount of time. x64 beta version does not yet work with USB mice, only PS2 mice. Using a PS/2/USB adapter may be a workaround. There is no trial version of the x64 version. Some work has been done to develop y-axis inversion as an AutoHotkey script. However, this has some issues when used in DirectInput games. I tried many options above to get my y-axis to invert only when middle mouse button was clicked. I tried all the above and failed. I finally got this to work on Battlefleet Gothic: Armada! Turns out what I had to do was use a combination of the two. Credit goes to this guy (sorry I don't know how to put a reference in but I'm so excited I had to share). Just change RButton to MButton in the autohotkey script. So simple. Xpadder can be used to invert the y-axis of the right analogue stick by setting the 'Stick 2' vertical movement to 'Inverted Axis RY'. It may be necessary to override the game's native controller support for this to work. Durazno is a XInput wrapper that simply sits between the controller and the game so as to allow for input customization. Extract and run the durazno.exe contained in the archive and choose to invert the right stick Y axis from the UI that comes up when launched. Quit the UI and copy the durazno.ini file and the xinput_1_3.dll file contained in the directory from the extracted archive into the root of the game folder. Start game and enjoy inverted right stick control mapping. For mouse inversion use the CuteMouse inverted axis build (set the appropriate version to run prior to the game). 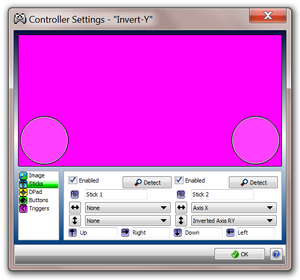 For controller inversion use the DOSBox Mapper to reverse the bindings as needed. This page was last edited on 6 August 2016, at 00:54.